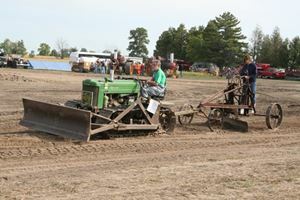 Steve Cornelius brings Earl, as past president Dean Wack has named his Euclid S7 scraper, out of the pit. 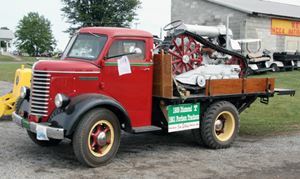 National Director Jim Schaus showed this 1939 Diamond T flatbed truck and its cargo, a 1921 Fordson with Trackson crawler conversion. 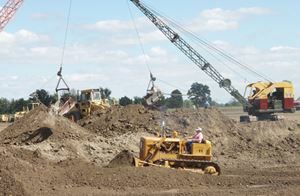 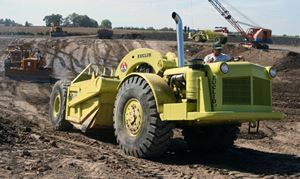 Jim Gangle’s 1957 HD11 keeps busy in the pit as David Jensen’s 1976 Hough H65C Payloader joins the Koehring 305 and Unit 1020 draglines in loading out the spoil. 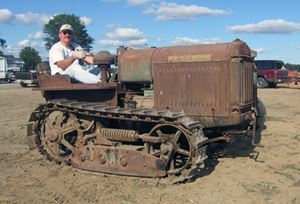 Dave Metcalf owns this John Deere 40C crawler tractor and Adams No. 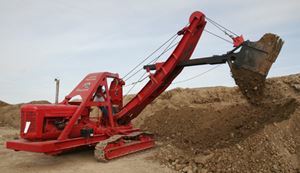 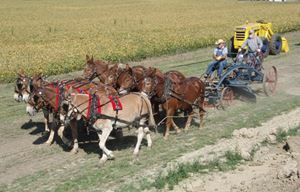 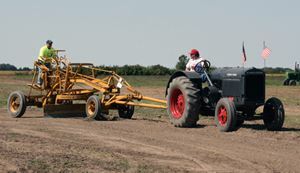 4 pull grader. 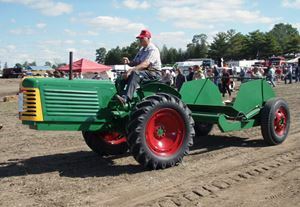 Not your normal motive power for a pull scraper! 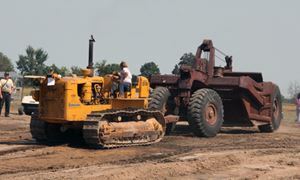 Past President Dean Wack’s 1965 Cat D6B wheel dozer conversion kicks up a little dust with Don Martin’s 1948 60 scraper. 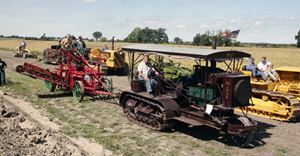 This 1929 McCormick-Deering 22-36, owned by Jerry Limpf, provides the pull for the Museum’s 1929 J. D. Adams No. 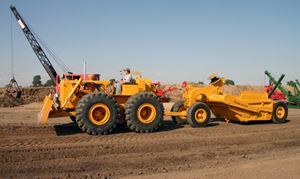 7 Leaning Wheel pull grader. 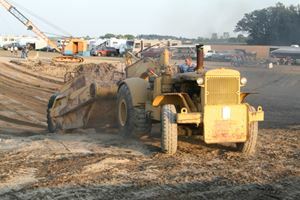 Mel Yates is the grader operator. 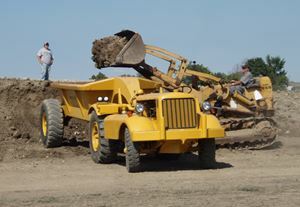 Don Martin’s 1946 Cat DW10 tractor and W10 bottom dump wagon is loaded out by Don Stewart’s 1957 Cat 955 Traxcavator. 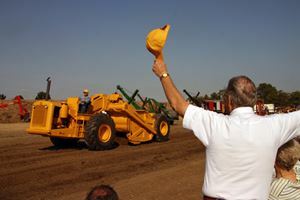 Dr. Roy LeTourneau doffs his cap as George Goldsberry brings a 1955 LeTourneau-Westinghouse D Tournapull, one of several LeTourneau machines that George has restored, through the power parade.